PORTLAND, Ore. — Using video to fire the latest salvo in a Sounders-Timbers rivalry dating back 43 years was hardly an unusual move by this city’s hometown side. After all, the Cascadia derby’s prior weapons of choice have included a real chainsaw, a make-believe ax, some choicely-timed Tifos, scatological emojis and even some Clint Dempsey fingertips tearing up a referee’s notebook. So, the Timbers commemorating Sunday’s 100thmeeting between the sides with the midweek release of a seven-minute video mockumentary of the Sounders titled “The Rivalry” amounts to business as usual. Still, their jabs at the Sounders and our city got a boost when famed documentarian Ken Burns chimed in Thursday on his official Twitter feed about the video, which borrows liberally from his more serious historical filmmaking style. “There is no re-writing of history but there are a multiplicity of points of view,’’ the tongue-in-cheek tweet stated. The Sounders lead the rivalry 50-35-14 across all competitions, though the video notes the Timbers won the Cascadia region’s first MLS Cup in 2015, a year ahead of coach Brian Schmetzer’s crew. The video’s recounting of the rivalry starts with Roger Levesque’s goal 48 seconds into their U.S. Open Cup clash in Portland on July 1, 2009. The Sounders were in their first Major League Soccer season while the Timbers were still a United Soccer League franchise. Levesque is referred to in the video as “a charlatan and a riverboat gambler’’ for his post-goal celebration. In a recent Seattle Times interview, Levesque described he and teammate Nate Jaqua plotting on the team bus that if either scored, the other would pretend to chop him down like a tree. That was to mock Portland’s lumberjack mascot Timber Joey and his Timber Jim predecessor, who used axes in routines and chainsaws to slice logs whenever the Timbers scored. Jaqua raced over to Levesque and pretended to chop away. Levesque kept his hands pinned to his sides and toppled over like a felled tree – enraging the fans and cementing his villain status. But the Sounders’ fans one-upped them, with the Emerald City Supporters unveiling a “Decades of Dominance’’ Tifo featuring several franchise legends. A second banner soon descended depicting a fist crushing a Timbers logo. Then, another was unfurled of a smiling Levesque and the words “48 seconds’’ in reference to his goal. In Tifo battles, it was game over. Legend has it the fan groups were tipped off in advance about Timbers supporters’ plans. Still, the Timbers took charge of the rivalry by ousting the Sounders in the 2013 playoffs. The following spring, Dempsey succeeded Levesque as Portland’s hated rivalry figure by scoring two late goals in Portland to salvage a 4-4 draw. He remains the rivalry’s focal point and all-time scorer with nine goals in 10 matches, three of them game-winners and six in the final 30 minutes. One came in the 94thminute here last June to salvage a 2-2 tie. 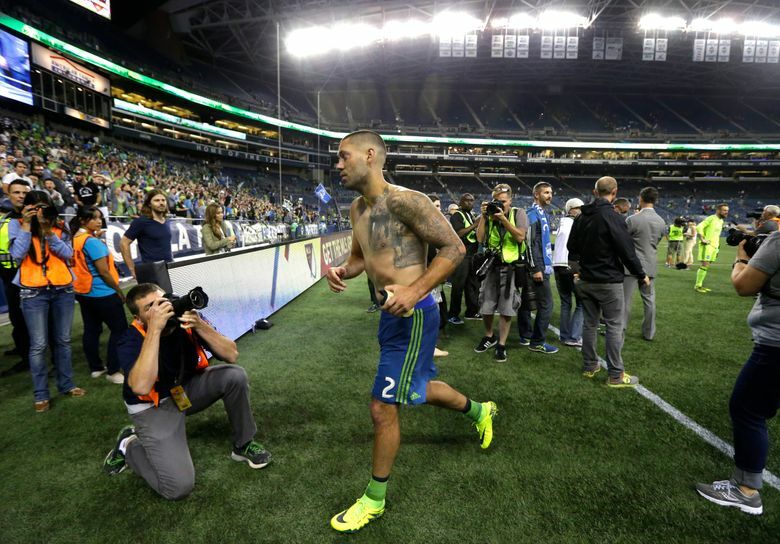 Dempsey’s most infamous rivalry moment came in June 2015, during a U.S. Open Cup loss at Starfire Stadium. With Portland up 2-1 in overtime, referee Daniel Radford sent off Michael Azira, leaving the Sounders three men down due to a prior ejection and injury. Dempsey lost his cool at that point, circled Radford and – when the referee was distracted – plucked away his notebook and tore it up. His antics that “Red Card Wedding’’ match earned Dempsey an ejection, a three-game suspension from MLS and a two-year U.S. Open Cup ban. The Sounders fired back their own scatological tweet, stating: “A __ joke from a __ club’’ and filled in the blanks with an emoji of a smiling pile of manure. Schmetzer didn’t take Dempsey to Toronto for Wednesday’s 2-1 victory. He knows Dempsey saves his best for Portland and wasn’t playing him three times in eight days. Dempsey’s goal-less 2018 has seen him serve a two-game red card suspension, then get benched much of the next match. Joining Dempsey on the field Sunday will be Norwegian import Magnus Wolff Eikrem, himself oft-benched due to concerns about his defending and adaptability to MLS play. Eikrem had a stellar assist in Toronto and is being given this stretch to show something. With Dempsey needing one goal to tie Fredy Montero at 47 for the franchise lead, Schmetzer is likely hoping he and Eikrem can team up on something big. It’s doubtful the Timbers will make a video of it if that happens. But for the Sounders, still finding their way at 2-4-2, their year-end highlight package could use some clips and Portland is as good a place as any to start.